The InstalTest 3017 is a logging tester with Pass/Fail limits preset to AS/NZS3017 and stores test results for printing installation verification and compliance test reports. A wide range of measurements to make electrical work faster, easier and reduce the number of instruments you need to carry around. Measurements and tests with fixed parameters and limits set to AS/NZS3017 and Pass/Fail indication. Also user defined limits for troubleshooting and general electrical work. 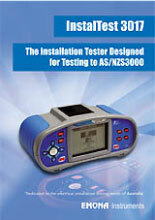 For fast testing and certifying of completed work to AS/NZS3000 Wiring Rules prior to energising the installation. For meeting obligations to customers and employees. Test results guarantee evidence of testing. PC based records can be easily be stored and recalled for required statutory period. Conduct the test, press the MEMory button to save the result and assign the result to a location, e.g. DB1/CB1 or 1st Floor/Room 5. 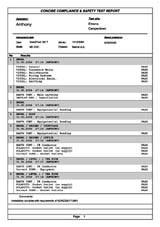 Download results to PC software and print-out compliance test reports with actual test results. Include Operator name, Test Site name, instrument and serial number,date and time of tests. 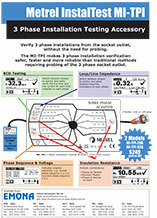 Verify 3 phase installations from the socket outlet, without the need for probing. Use with InstalTest COMBO or IT3017. The MI-TPI makes 3 phase installation verification safer, faster and more reliable that traditional methods requiring probing of the 3 phase socket outlet.